Thursday November 17th 1892 It snowed all day long in a terrific manner. I kept close in the house and sewed on Mothers shirts which I finished and got considerable done on Wills shirts. We put away our pumpkin that we have been stewing for the last few days. I have a very [hoarse?] cold my voice is nearly gone. It came on at supper time. Friday November 18th 1892 I do not feel very much better. I sewed what time I had I finished Wills night shirts and fixed a night gown for myself. weather brighter. snow nearly a foot deep. Saturday November 19th 1892 I felt very bad all day. The girls were over in the forenoon. I did some baking and the afternoon worked on some lace I had begun for pillow cases. I felt very bad and went to bed early. Mother put hot poultice on my chest and gave me a good sweat to break up my cold. Sunday November 20th 1892 I did not sit up all day. My cold is broke and my voice is conming back to me. The Whetstones were over in the afternoon. Will went to Marys for a little while. I sat up and read some in the evening. weather a little milder. Charlie & Ida married eight years. Monday November 21st 1892 I felt better and got up when breaskfast was ready. I sewed some in the afternoon and evening on shirts I am fixing for Father. weather more mild. 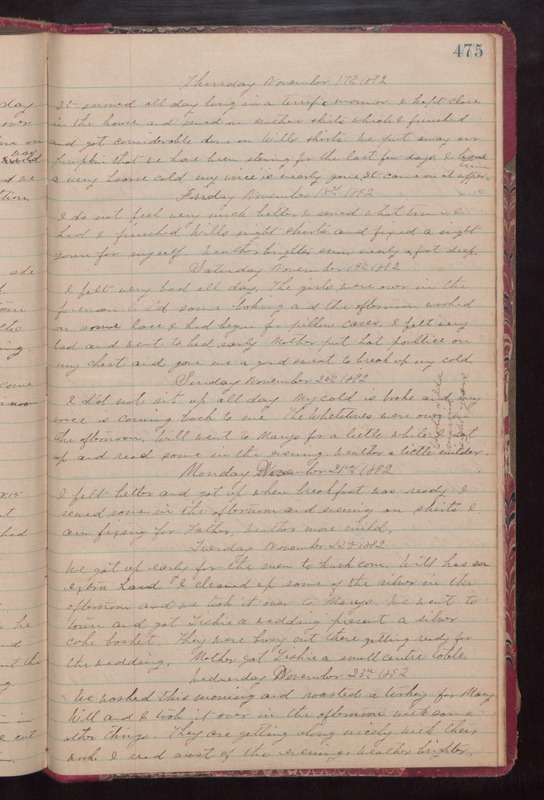 Tuesday November 22nd 1892 We got up early for the men to husk corn. Will has an extra hand. I cleaned up some of the silver in the afternoon and we took it over to Marys. We went to town and got Tishie a wedding present a silver cake basket. They were busy out there getting ready for the wedding. Mother got Tishie a small centre table. Wednesday November 23rd 1892 We washed this morning and roasted a turkey for Mary. Will and I took it over in the afternoon with some other things. They are getting along nicely with their work. I read most of the evening. weather brighter.